This is a guest post from John McKiernan (ex of Moonbow Jakes) about 'Up the Line' an event he is organising in Brockley and Ladywell Cemeteries for Armistice. The event will take place on 11.11.09 from 7.30 until 8.41 (1 hour 11 minutes). "War is ultimately about death and destruction, avoiding war is by remembering the pain and suffering associated with it rather than victory or defeat. There is probably no more a war in history that teaches us this than the Great War. With the passing of the last witnesses to WWI there appears a need to entrench the memory of this war, more than any other, on people of today. On all sides a whole generation was lost and to avoid repeating a mistake often means a strong reminding once in a while. Brockley Cemetery is a beautiful, almost unaltered space, with two very poignant memorials to those who died from their wounds on their return to the UK during WWI. Local men in the main, from early teens to their forties. Many, if not most local people know little or nothing of the memorials or those who are engraved on the walls, including those who perished in Deptford during the first London Blitz of WWI from the Zeppelin attacks. On Armistice Day, November 11th at 7.30 an event is to be held to recognise the sacrifice of these young men and others and the work of those who have tried to keep their memory alive. The intention is to create a simple experience that is sober rather than sombre yet powerful enough to lodge deep in the mind of those who attend. It is not intended as a history lesson but a history reflection that will be easy for all ages. The event will be a lantern lit walk through the cemetery during darkness and regardless of the weather conditions. 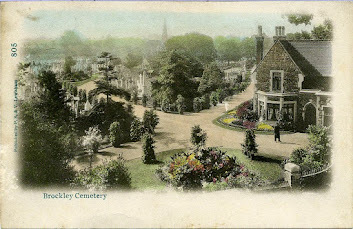 The route can be from either Brockley Road to the Ladywell gates or vice versa. The route will have poets and classical performers reciting from appropriate pieces and writings of the time. Contemporary dance will capture the essence of passing and a silent film and soundscape expressing the 'ordinariness' of how the War became during this period. The intention is not to create an education event or an exploration of people's opinion of war; the intention is to lodge an experience in the mind that will create questions and memory. The purpose is to attract as many families and younger people as possible, to have an unusual experience in an unfamiliar environment that will bond in the psyche. In the days, months, years that follow it would be hoped the audience will occasionally remember the evening of poetry, classical music, dance and a beautiful local cemetery and by association WWI, and the impact and loss it caused. People are encouraged to come with differing generations of family, friends and neighbours including the young and the senior. A slow walk will take approximately 25 minutes maximum you can arrive anytime up to 8.25pm. The Rivoli ballroom have kindly offered to open for people to gather to discuss and chat regarding their experience of the evening. This event involves many individuals and organisations who have made this event a reality. 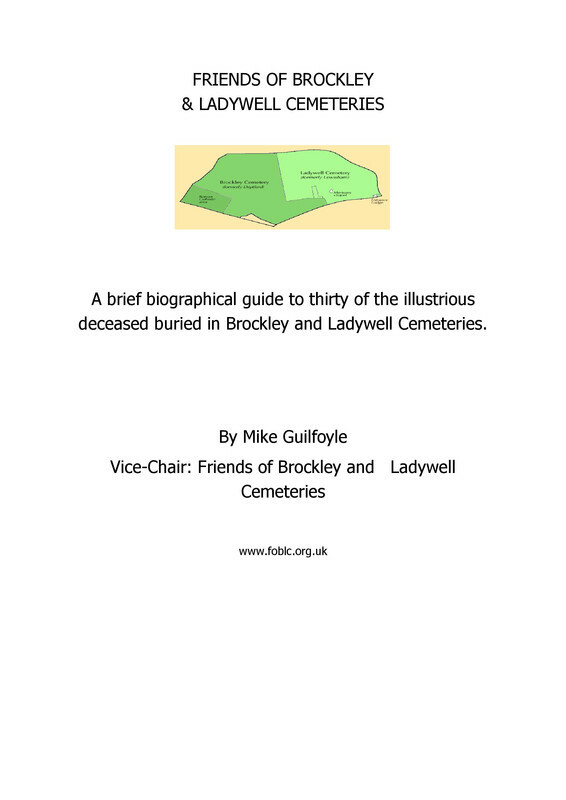 Friends of Brockley and Ladywell Cemeteries, the Royal British Legion club in Crofton Park, many departments, officers, councillors and the Mayor of Lewisham Council, Lewisham Police who will be organising a guard at each entrance, Max Media Arts (Brockley Max), Mr Lawrence's, Rivoli, Oscars of Ladywell, South London Press and a huge array of talented artists from across London who will be performing in silhouette on the night. Full details will be on the Brockley Max website and the event is bought to you by Moonbow Jakes events. This is a borough wide event to honour all those who died from and in Lewisham and remembering those from overseas who are also laid to rest on our behalf."